Daikan launches a factory for manufacturing signage letters in Taisho ward of Osaka city. 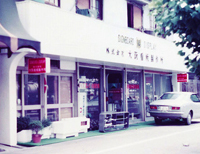 Daikan establishes as signage-manufacturing corporation in the same ward. Starts manufacturing acrylic furnishings and TV stage sets. Renamed to DAIKAN CO., LTD. as of today. Releases "Chisel-art Signs" copper relief signs using hand down hammer tone technique [patented]. First exhibition at JAPAN SHOP SHOW in Tokyo. 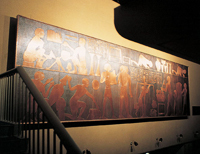 Developed technique for producing durable patina on copper sheets used for roofs. First applied on Japanese shrines, this novel material widely spread among other public facilities. Obtains patent No. 1559295 for above-mentioned "copper sheet patina" production process. 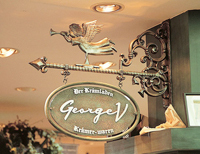 Starts manufacturing European-style "cast signs", i.e. panel signs and sign brackets. Releases photopolymer mold system-based cast signs, and stone signs made of natural marble and granite material. Issues a first catalogue with a complete line-up of signage, including metal signs, stone signs, wooden signs, etc. Starts production of letter-shaped plant pots. Introduces 3D Signs called "Cube Letter & Relief" based on original technique. Develops "metallic pipe etching" technique. Releases "etched pipes". Starts using 3D-plate unfolding software in manufacturing process. With introduction of 4kw CO2 laser machine, standardizes non-oxidized cutting of 5mm stainless steel. Opens Daikan's corporate web site. Releases Daikan's original catalogues "CAST SIGN" and "NAME PLATE". Develops Deuro Series Sign Systems. Releases Daikan's original catalogue "INFORMATION SIGN". Releases digital version of "INFORMATION SIGN" catalogue in CD-ROM format. Releases newly developed "Taff Lite Sign", i.e. a metal plated plastic sign letter which can perform a substitute for stainless steel SUS 304. Releases newly developed "D-Letter" sign. Releases comprehensive catalogue "DAIKAN CATALOGUE Vol.10." Starts "i-custom division" for car dress-up emblems. Introduces "7 head router" multi-cutting equipment for Taff Lite Sign and D-Letter enabling making of such products as room numbers. Starts manufacturing official emblems for Japanese professional baseball team Hanshin Tigers. 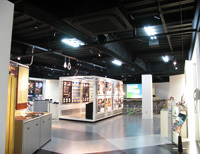 Introduces "Letter Sign 2003" catalogue at SIGN & DISPLAY SHOW 2003 in Tokyo. 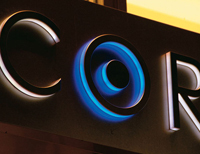 Develops illuminated sign "Lumi Letter" using high-luminance LED; submits patent application. Releases English version of "Letter Sign 2003" catalogue. With adoption of UV ink-jet completes and releases "DPS (Direct Paint Sign system)" which surpasses screen-printing. Adopts Automatic Bevel Trimming w/ Diamond Polishing Machine. Releases catalogues "LETTER SIGN 2" and "INFORMATION SIGN for OFFICE". Becomes a full product range supplier for "THE UCHOUTEN HOTEL" movie. First participation as an exhibitor in the overseas trade fair SHOPFIT '06 held in Melbourne, Australia. 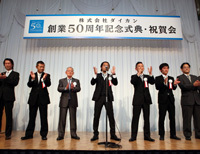 Opens second factory in the same ward of Osaka. Remodels head office facilities and opens showroom on its 3rd floor. Exhibits Lumi Letter and Taff Lite Sign at KOSIGN SHOW in Seoul, Korea. 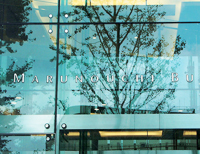 Releases the 7H Daikan hard acrylic which is comparable to glass surface hardness. Establishes office in Ho Chi Minh City, Vietnam. Obtains "luminescent display device" patent for Lumi Letter mini. Establishes Daikan Vietnam factory in Amata industrial park. 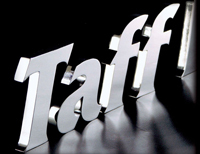 Introduces newly developed Taff Lite Sign and D-Letter with embossed finish "Real Texture". Exhibits at "EuroShop 2011" trade fair held in Dusseldorf, Germany. Exhibits at "Retail Asia Expo 2011" held in Hong Kong. First exhibition at Digital Photo & Sign Vietnam 2012. Obtains UL certification on our Lumi Letter series and LED Channel series. Opens representative office in Hong Kong. 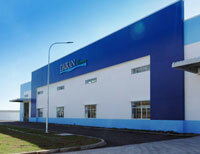 Daikan Vietnam Relocates to a larger factory in the same industry park, Vietnam (2nd stage). Established a local subsidiary "DAIKAN HONG KONG LIMITED". 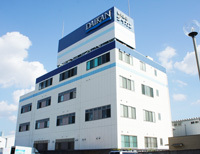 Daikan Vietnam Relocates to a larger factory in the same industry park, Vietnam (3rd stage). 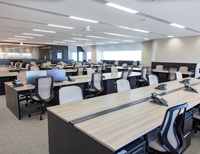 DAIKAN Hong Kong Limited has been relocated and expanded. Established a local sales office as "OSAKA OFFICE" in Parks Tower 13F at Naniwa-ku Osaka City.